The Hinterland Explorer tour offers a truly unique opportunity to see Laos, from the regal beauty of Luang Prabang, a Unesco World Heritage Site to the rural villages where you stay the night with an authentic local family. A trip to Laos, the realm of "A Million Elephants", the former Kingdom of Lan Xang, the warm heart of Indochina, whatever you call it, the land remains something truly special. Our exhilarating tour through Northern Laos is ideal for the active visitor and traveler who wants to get a glimpse behind the curtain. We embark on a journey of discovery through the history, culture and Lao way of life between village and city life, modernity and history. Combining a FairTrek, Kayaking, biking and elephant experience this tour shows all the adventure that Laos has to offer. With the option to include a two day Mekong cruise to the Thai border this complete adventure brings together the best of Laos. Later, a boat ride takes you to the cascade of the Tad Sae waterfall where we can take a refreshing swim (waterfall dry Feb - July). After a short hiking trail in the afternoon we meet our host family in a small Laotian hilltribe village. Here we are invited to cook, eat, and converse together until you are ready for bed. Awakened early by the roosters in the village, we start our hike through the hilly landscape of Laos. On the trek between Hmong and Khmu hilltribe villages, there is much to see and learn. We have the unique opportunity to share the cultures of rural life of the Lao as we observe the lifestyles of the Hmong and Khmu. There are many trails to choose from, depending on your stamina - some shorter and others longer. In the afternoon we paddle back to Luang Prabang in kayaks along the Nam Khan. Kayaking this small river is a cool and relaxing way to end these 2 days of adventure. Overnight in a guesthouse in Luang Prabang. Today we set out on a FairTrek to Ban Na Luang. The FairTrek Initiative aims to give back to local communities and encourage conservation through responsible tourism. By taking part in a FairTrek and homestay you will be giving back to the local villages through the FairTrek Fund whilst enjoying an authentic cultural exchange. The trek takes around 2-3 hours and is suitable for most levels of fitness. In the ethnically diverse village of Ban Na Luang, we can learn about the local traditions and the lifestyle of the local population. 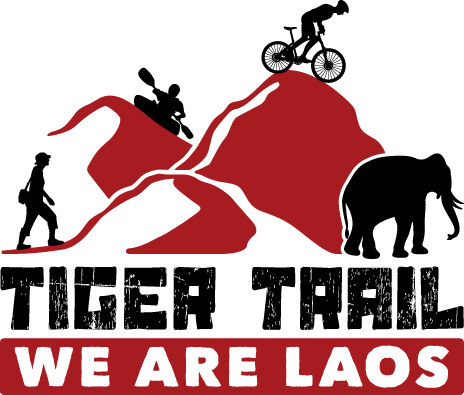 The Lao Looum and Lao Soung represent different ethnic minority groups and we can experience the differences while we stay at their homes here for the night. The landscape is dominated by rice fields and stunning rock formations, making this a beautiful natural environment to spend the evening..
Today we'll take a small path to another village where we'll take a short break before we board a traditional boat to bring us back to Nong Khiaw on the Nam Ou river before getting on the local bus that will take us back to Luang Prabang. Arrive in Luang Prabang by late afternoon and overnight at a guesthouse. Take the day to explore the charming city of Luang Prabang. Having been listed as a UNESCO World Heritage Site for twenty years Luang Prabang retains it's Royal Lao splendour and stunning French inspired architecture. Relax by the mekong or maybe take a cooking class. For guests enjoying the 8 Day tour our services end here. Today we will welcome you aboard a traditional Laos Slowboat for the trip on the Mekong River into the north of Laos. This majestic river flows from the Tibetan Plateau through China, Burma, Thailand, Laos, Cambodia and Vietnam. Along the way we take the time to visit the local villages and the famous Pak Ou Caves, which thrills both tourists and devout worshipers with its hundreds of Buddha statues of all styles and sizes. Mekong cruise arrives in Pakbeng in the late afternoon where you'll stay the night. In today's leg of the trip on the Mekong we watch forests, villages, and bright green landscapes as we cruise along the river. The tranquility and the rural life on the banks impresses visitors again and again. In addition to the water buffalo, you can sometimes even see working elephants on the banks of the Mekong River, a truly special sight. We'll enjoy a village life visit along the way before we finish this wonderful Mekong tour in Houay Xai, the border town to Thailand.